This is part of my Cheng Pei-pei review series. You can see my other reviews of her movies here: Come Drink With Me, Brothers Five,The Lady Hermit, and The Shadow Whip. Dragon Swamp is unusual, even more so that The Shadow Whip, for a number of reasons. The setting is highly atmospheric, bordering on fantasy or horror in terms of look and feel. Watching it one is reminded of old Hammer Studios sets, with its fog filled bogs and sound-stage wilderness. There is even a hint of Yoda's Dagobah here. This is wuxia done with heavy emphasis on the fantastic, with an adventurous plot revolving around the theft of a magic sword called the Jade Dragon (supposedly the same sword stolen by Jen/Jiaolong and Jade Fox in Crouching Tiger, Hidden Dragon). Youth preserving elixirs, Qi powered energy blasts and ancestral curses abound in Dragon Swamp. One of the most interesting aspects of the movie is Cheng Pei-pei plays two different roles, sharing screen time with herself. 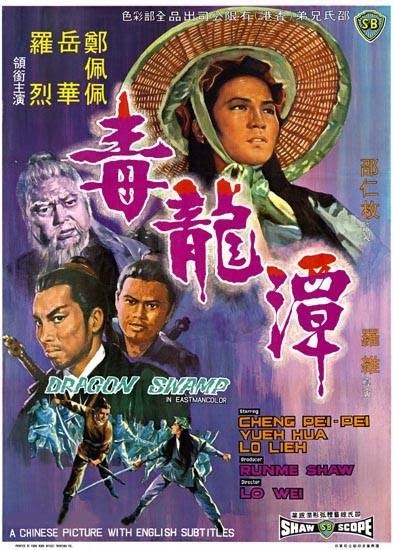 Dragon Swamp was released by Shaw Brothers in 1969 and directed by Lo Wei. It is another movie pairing Cheng Pei-pei (Fan Ying and Qing-er) with Yueh Hua (Roaming Knight). It also stars Tung Li (Dragon Swamp Master), Lo Lieh (Yu Jiang), Wong Chung-Shun (Dachuan/Song Yue/White Faced General), Ku Feng (Master Song Junyi) and Lo Wei (Master Fan). Cinematography is by Wu Cho-Hua and Art Direction by Chan King-Sam. The movie begins as Dachuan tries to flee from Lingshan Chunyang Taoist Temple after stealing the Jade Dragon Sword. The temples takes back the sword but he escapes with his eldest son, leaving his wife, Fan Ying, and their infant daughter, to face the consequences of his actions. Master Fan, leader of the Lingshan Sect, reveals that Dachuan is actually a man known as White-Faced General and accuses Fan Ying of aiding Dachuan to take the sword. According to Master Fan, Dachuan had stolen the sword three years prior, and remained with Fan Ying for three years in order to learn the temples' other secrets. Fan Ying pleads her innocence and it is unclear from the subtitles if she was tricked, ensorcelled or willingly helped Dachuan. Master Fan decides to follow the laws of his order and banish her to the Dragon Swamp for 20 years. He shows some compassion, giving her two daggers and a spell, as well as advice on how to survive, including telling her about the dangerous but capricious Dragon Swamp Master. He then says he will raise her daughter for her in the safety of the temple. We see Fan Ying depart by boat to Dragon Swamp and then the film flashes forward. Twenty years later we see her daughter, Qing-er (who doesn't know about her mother Fan Ying) playfully practicing as instructed by her master. She returns to her fellow students in the temple as another thief (this one masked) once again takes the Jade Dragon Sword from the Jingang Pagoda. Master Fan announces the theft to his students, telling them of the swords bloody history (which according to the subtitles killed an incarnation of the Buddha), and saying that the blade will curse the family of anyone who takes it. He then instructs his students to depart and find the sword. We next see Qing-er in Zhennan, in a small town under the effective control of a man named Yu Jiang). Qing-er learns that Yu-Jiang is head of security and plans to host a feast that evening. Going to the feast, Qing-er meets another wandering warrior who simply calls himself Roaming Knight. They form an immediate connection as Qing-er falls under the suspicion of Yu-Jiang, who seems to recognize her. He has his men attack her and we are treated to an excellent tea house fight scene. Roaming Knight helps defend Qing-er who learns through an exchange that Yu-Jiang was the masked thief who stole the sword. Yu wounds Qing-er with the Jade Dragon, so Roaming Knight carries her away and escapes to the wilderness. As he treats her wounds, Roaming Knight says that Qing-er looks like his long lost love, a woman who left him for another man and disappeared twenty years ago. He wants to help her, and says that the Dragon Swamp Master is powerful enough to help her get the sword back. The two set off for the swamp, intending to ask the Master for assistance. The journey through the swamp is lots of fun, if riddled with questionable effects. There are enormous monitor lizards shown in the background, but you can see the screens these images are projected on to. They encounter sinking sand traps and aquatic monsters before they receive an audience with the Dragon Swamp Master, who is protected by an army of all female warriors. Dragon Swamp Master hears their case and promises to help. Roaming Knight is grateful and departs to continue his search for his lost love. After he leaves the Dragon Swamp Master is revealed to be Fan Ying dressed as a man. She uses a facial mask to hide her features and the hairs of a dragon to disguise her voice. By consuming dragon bladders for the past 20 years she has also kept her youth. While she doesn't tell Qing-er that she is her mother, Fan Ying clearly cares for her and says they should be sworn sisters. She also informs Qing-er that she killed the original Dragon Swamp Master years ago. Together they go back to Yu Jiang to take the sword (though Fan Ying disguises herself as the Dragon Swamp Master for the journey). I will say more about this later but it is worth mentioning here that Cheng Pei-pei does an excellent job playing two separate characters (though when she is dressed as Dragon Swamp Master another actor plays the role). The split screen is quite seamless and the mannerisms between both her roles are entirely different. When they reach Yu Jiang's estate, we get another impressive fight. When the underlings demand to know their attacker's identity Fan Ying as Dragon Swamp Master says "You'll piss your pants if I tell you my name." I don't know if this is an accurate translation of the original dialogue but the delivery had me laughing. It was a bold and humorous line. After beating, but not harming, Yu Jiang's men, they are invited to speak inside. There Yu Jiang proves eloquent but treacherous, refusing to give them the sword. 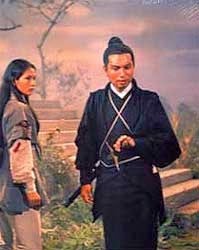 After another fight, which features several fantastic wuxia powers, Fan Ying/Dragon Swamp Master subdues Yu with a technique I refer to as Gravity Palm, pulling him against his will and demanding he turn over the sword. Ju Jiang seems to relent, and bows to show his defeat, but this only unleashes a red plume of poison gas that afflicts Fan Ying. He then tells Fan Ying she only has 8 days to live, but Fan Ying strikes him in the face with her own poisoned darts, and informs him he has only five days to live, and will need to give her an antidote if he doesn't want to die. Yu Jiang seems to agree and says he will take her to his master, he also relinquishes the sword. Fan Ying gives the sword to Qing-er and tells her to go back to Lingshan Temple and return it to Master Fan. Reluctantly Qing-er agrees. Just before she leaves we see Yu Jiang whisper something to two of his men, who depart with devious looks in their eyes. On the road back to the temple Qing-er is sidetracked and led to believe the road ahead is closed by flooding, so she takes a shortcut and finds herself at an inn. The scene that unfolds clearly references the iconic inn fight from Come Drink With Me but is still quite well done. As Qing-er sits to take her meal, one by one, different masters come into the inn's tavern and give her intimidating stare. These are each men she encountered along her to the inn, so it is clear she has been set up. They attack and she kills and wounds several. Cornering the leader she demands to know who sent him, but he pleads that he is just a bandit and they mistook her for an easy target. She lets him go and he returns later than evening, stealing the sword from her room and leaving a fake one in its place. In the morning Qing-er knows immediate that the Jade Dragon has been stolen and demands the inn keeper tell her about the men who attacked her the night before, threatening to kill him if he doesn't talk. He has no useful information but she follows a set of wagon tracks to the villa of Master Song. Fan Ying is already in villa, as Yu Jiang's master is none other than Dachuan, now calling himself Song Yue and serves as an important underling to Master Song Junyi, leader of the Song Clan. It appears Dachuan has a plan to overthrow his master and control the 72 Clans. Fan Ying gives Yu Jiang the antidote but Dachuan refuses to give her one in exchange. She reveals her identity to him but he still refuses saying he must kill her since she knows the secret of his identity. Qing-er arrives at the gates of the Song compound and there she also meets Master Song (who knows nothing of the theft) traveling with Roaming Knight (still looking for his lost love). She tells them what happened and they go inside the villa with her to confront Dachuan. We get a splendid battle that ends with Roaming Knight being mortally wounded and Master Song being driven into a locked hall with some of his remaining loyal men. During the battle Roaming Knight sees Fan Ying and she tells him that Qing-er is her daughter. Qing-er escapes with Roaming Knight to treat his wounds, but he is dying. Before he passes he reveals that Fan Ying is her mother and Dachuan her father. As Qing-er weeps over the body of her lost friend, one of her temple brothers happens upon her and agrees to help her take on Dachuan. Before setting out he sends a messenger bird to inform their master. Back in the Song Villa, Dachuan is planning his rise to power and has placed Fan Ying in a dungeon. Yu Jiang hears her cries of pain from the poison and feels pity for her. He then goes to Dachuan, who seems to acknowledge him as his son, and requests that they give her the antidote and let her go. Dachuan is reluctant but says he will consider it after Fan Ying gets the seal of the Songs for him (which is contained in the hall holding Master Song Junyi). They set fire to the hall and Yu retrieves the seal. Qing-er fights her way to the dungeon and rescues her mother. Just as Dachuan's plans are about to succeed, Master Fan arrives and blasts the mastermind with a Qi strike, causing him to caught up blood. As he lay dying, Qing-er arrives with Fan Ying and they learn that Yu Jiang is her eldest son (taken 20 years ago). Dachuan gives Fan Ying the antidote, appears remorseful and asks her to protect Yu Jiang. Fan Ying begs asks her master to show mercy, but he banishes her son to Dragon Swamp for 20 years, and tells the mother and daughter to return together to the temple. There are some strong swordplay scenes in the movie, particularly the first one during Yu Jiang's feast and the fight between Qing-er and the bandits at the Inn. Swamp Dragon also mixes in plenty of magical wuxia powers, like energy blasts, air gliding and more. It is definitely a treat in this respect and it keeps a very steady, energetic pace. The fight choreography isn't quite at the level of Lady Hermit, but it is still quite good. However this more than just a series of fights strung together loosely by plot, it is a story of redemption and family, as well as a great fantasy adventure. The sets and locations immerse you in another world. Fan Ying's Dragon Swamp lair is a subterranean paradise. The Lingshan Temple feels like something out of Raiders of the Lost Ark, complete with a booby trapped pagoda. On that level this is a highly engrossing film. Some of the effects are poor. Part of that is what was available at the time, some of that is a product of execution. It is all forgivable, and at times even adds to the movie. However the split screen is done well, and the wirework isn't too shabby. Particularly worthy of praise is Cheng Pei-pei's performance as both mother and daughter. You really believe these are two different characters. There was no need for willful suspension of disbelief as her movements, mannerisms, and voice capture distinct personalities. There are also many touching moments in Dragon Swamp. The relationship between Qing-er and Fan Ying is done well, with plenty of sentimentality. The death of Roaming Knight is effective and the redemption of Dachuan is poignant. For gaming this movie has a ton of stuff. Between the swamp and pagoda alone there is lots to incorporate into a game. The character backgrounds would all serve great for NPC material (even PC material). The conflict between Master Song and Dachuan, also would work well as a campaign backdrop. I highly recommend Dragon Swamp. It is one of the better Cheng Pei-pei movies in my series of reviews. It is an especially good choice for someone not as familiar with the genre, but who likes fantasy or adventure films. One note of caution: like some of the other Cheng Pei-pei movies I will be reviewing soon, Dragon Swamp is difficult to find these days. Not only is it hard to locate but the only copies I have ever seen have all been in formats like region 3 (which is difficult to play on an American DVD player) or even video disc. This is made worse by the fact that collectors are largely the ones acquiring copies, so prices can rise.